Bummer. There was a problem adding your email address. British historian Irving (The Destruction of Dresden, The Trail of the Fox, Hitler's War, etc.) now undertakes a surprisingly rare--and baldly melodramatic--documentation of Hitler's number-two man, Reichsmarschal Hermann Goring. Despite Iving's access to exhaustive archival material, his penchant for pop-dramatics mars what could have been a definitive work. In his overeagerness to get to the meaty years, the author dispenses with Goring's first 25 years in a mere 20 pages. Afterwards, we are treated to such authorial excesses as a description of Goring responding to a Hitler rampage against the Versailles Treaty: "Goddammit, thought Goring, that's the stuff!" Or, after quoting the bragging of Gestapo chief Diels that he had his finger in many pies, this bonbon: "One of the sweetest pies Diels had his fingers in was an American lady. . .Martha Dodd, the U.S. ambassador's. . .daughter." Even on firmer ground, Irving fares no better. Too often, he portrays Goring as a peaceful man who was forced, out of fear of Hitler, into ruthlessness. And Irving's presumption to "solve" the question of Goring's death (already well-known to be from a cyanide suicide on the day of his appointment with the gallows) is based upon wholly circumstantial evidence (that a Dr. ? ?flucker brought the pill to him and later planted a suicide note in his dying hands). 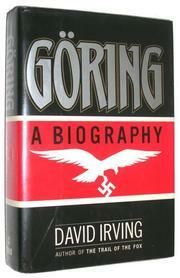 One of Irving's only genuine coups may be in setting the record straight concerning a mid-1920's trip to Italy made by Goring on behalf of Hitler's fledgling movement: Most biographers have assumed that Goring then met with Mussolini, but Irving fairly conclusively shows this to be untrue, a rumor encouraged mostly by Goring's own braggadocio. Seeded with many juicy quotes from insider conversations, this is a work best suited for those who prefer their history a la network docudrama. Goring remains in search of a more mature and thoughtful treatment.